Halo of Power is an addictive political thriller focused on the biggest sociopolitical questions of our time. 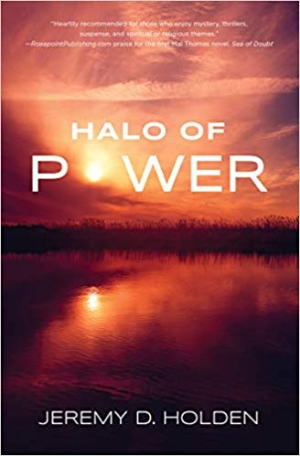 Jeremy Holden’s thriller Halo of Power continues the adventures of Mal Thomas, the world’s most exciting advertising agent and novelist. In this novel, Thomas and his eccentric billionaire friend Huw Hudson enter the spiritual realm in order to save religion and the globe’s democracies. As the story begins, the world is riveted by news that the Dalai Lama has been murdered. Thomas, a close, personal friend of the holy man, had made him a promise to undertake a globe-trotting journey and explore the world’s spiritual truths. His journey takes him to the tropical forests of Costa Rica, the high mountains of Nepal, and the lush beaches of the Bahamas. Thomas’s mission runs afoul of the Chinese government, though, which is seeking to use the Dalai Lama’s death as leverage for further repression in Tibet. As part of this scheme, the Chinese announce that the Dalai Lama’s replacement will be a three-year-old boy from Amdo Province, Tibet. A rival claimant, Devna, threatens tradition because she is female and has the support of the Queen of Great Britain and other Western leaders. Told with humor and intelligence, the novel envisions a world conflict over the holiest position in Tibetan Buddhism. On the one side stands autocracy and central state control. On the other stands democracy, which the book’s Dalai Lama supports as semi-divine. Thomas is the perfect foil for this battle—a charming, slightly rakish adventurer who supports a progressive cause. Many of the book’s themes touch on contemporary politics, from China’s rise to global power status to the increase in social media manipulation and the #MeToo movement. Each topic is handled with maturity. The book’s reliance on mystery and espionage fiction tropes––Hudson, for example, is a billionaire with a penchant for understated humor who functions as a pale imitation of James Bond––mean that the novel is predictable in places. In one scene, Hudson and Thomas escape from Chinese intelligence agents in a manner that parodies kitschy spy thrillers. There’s little realism to the book’s political intrigues. Though primarily told in plain and modern language, the text features flourishes that are almost lyrical. Thomas is a jaundiced observer, and his sardonic humor and wit makes the book humorous and exciting. The conclusion is almost perfect: the entire battle over the Dalai Lama is revealed to be a parable about life, society, freedom, and the path towards enlightenment.